What’s More (Italian) American Than Baseball? It’s that time of year. “One, two, three strikes your out at the old ball game.” As we wallow in the World Series, who can help but remember the greatest of the greats. The line is long, but for some reason a lot of uniforms in that line sport pinstripes. Sandwiched in between Babe Ruth and Lou Gehrig on one side and Micky Mantle on the other side is the Yankee Clipper himself, Joe DiMaggio. Joltin’ Joe was long retired and within a few months of renewing his relationship with Marilyn Monroe by the time I was born. Still, for some reason I always felt an affinity to him. In sixth grade the teacher gave us the assignment to write the biography of our hero. 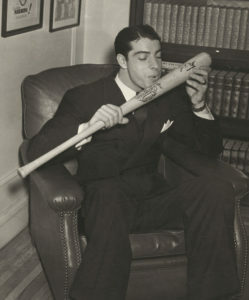 I chose Joe DiMaggio. What could I say. He’s Sicilian.